ARUGULA or LACINATO KALE: Wed. CSA members will receive Arugula (also known as “wild rocket”; an aromatic, bright salad green with more deeply lobed leaves and a peppery mustard flavor) and Fri/Sat CSA members will receive dark green, noncurled, blistered leaves, but heavily savoyed). See Week 1 newsletter for usage and storage tips. GENOVESE BASIL: Everyone will receive Basil this week, an herb with sweet, spicy, shiny, green leaves; traditionally used in pesto; we supply it with root attached, so it will last longer when stored in a jar, vase, or glass of water on your counter or table top. Remember this is the best time to make Pesto, dry it, or freeze it. BROCCOLI: deep emerald green, tiny buds that are clustered on top of stout, edible stems; high in vitamins A, C, calcium, potassium, and iron; known as an anti-cancer vegetable. See Week 6 newsletter for usage and storage tips. NO HERB BUNCH THIS WEEK! Most of our herbs are taking longer to grow back, so we are letting our smaller patches of herbs recuperate, but you will receive Genovese Basil. KALE (Green Curly): well-ruffled, curly green leaves on green stems; this variety makes a good, roasted “kale chip”. See Week 4 newsletter for usage and storage tips. LETTUCE: You will receive Green or Red Leaf lettuce and/or Romaine lettuce. See Week 1 newsletter for usage and storage tips. GREEN ONIONS (also called “Scallions”): young shoots of yellow bulb onions with long green stalks and milder taste than bulb onions See Week 1 newsletter for usage and storage tips. NEW POTATOES (Red Norland): smooth, red skin and white flesh; great baked, boiled, or roasted. **These potatoes have not been cured, so will not last as long as “cured” potatoes, which should not be refrigerated, since low temperatures convert starch to sugars and may turn dark if cooked. See Week 7 newsletter for usage and storage tips. SWISS CHARD or CABBAGE: Wed. CSA members will receive Swiss Chard (closerelative of garden beets; multi-colored, large veined, semi-crinkly, dark green leaves; mild flavor. See Week 7 newsletter) or Cabbage (a sweet green cabbage; considered a beneficial digestive aid and intestinal cleanser. See Week 7 newsletter for usage and storage tips.). 1. THANKS TO THOSE WHO CAME to the SUMMER WORK PARTY on July 15. Thanks so much for joining us for delicious potluck food, berry picking, and good companionship at the Summer Work Party, while Bethanni’s flute and trombone music floated through the air. We clipped about 20 crates of garlic, stripped some dried herbs and put them in jars, and picked up summer apples to feed to some very hungry pigs! 2. STILL ROOM IN KIDS’ COOKING CLASS on JULY 22 from 1 to 3 PM: PLAY with your FOOD! Leave behind the summer bustle to celebrate summer produce with your child. Personal Chef Allison Anastasio Zeglis, from www.lastbitechef.com, will show you how to approach a CSA box, family style. Using a few classic techniques that can be adapted to a variety of vegetables, cook your way through a share box with your child. Get hands on experience as a dynamic duo tackling cooking projects and then enjoy eating them together at the end of the class. Please register with your NAME and your child’s NAME, child’s AGE, PHONE, and EMAIL ADDRESS. Please bring $10/person, but if financial difficulties, please let us know. More details coming! 3. FAMILY FARM HIKE on Aug. 3: Come join us for a guided monthly exploratory walk around Tantre Farm on Friday, Aug. 3, at 4 PM. We’ll use all our senses as we take an approx. 45-60 minute hike with CSA member, Alisse Portnoy, who teaches at the University of Michigan. She and her daughter are in their ninth year of once-a-week, long visits to the farm. They look forward to sharing some of its treasures and treasure spots with you. Meet at the picnic tables behind Main House at 2 pm. 4. WEEDING VOLUNTEERS NEEDED, especially in the HERB GARDEN & FLOWER GARDEN: If you are interested in helping out, please contact us any day of the week or evenings until dark. Thanks so much to all those, who have helped out so far! 5. HARVEST KITCHEN ENTREES FOR SALE and PREPARED FOOD CSA COMING SOON: Harvest Kitchen, now under the direction of 2 times James Beard nominee chef Magdiale Wolmark, is Richard and Deb’s latest business project. Harvest Kitchen and Tantre Farm work in close collaboration to showcase seasonal produce from the farm on Harvest Kitchen menus and will be our new Prepared Food CSA opportunity within the next couple of weeks. In preparation for our new CSA launch, Harvest Kitchen will begin to offer sample products from their locally sourced and deliciously prepared subscription meal plans from 6 to 8 PM on Wednesday evenings at the Washtenaw Food Hub (4175 Whitmore Lake Rd.). Look for seasonal salads made with Tantre produce and chef driven prepared meals featuring pasture raised meats, and take home a taste of Tantre summer that you didn’t have to cook! They also are at the Saturday Ann Arbor Farmers Market every week, so check out what they have for sale. -Ann Arbor Farmers’ Market (Wed.)–7 A.M. to 12 P.M.
-Farm (Wed.)–10 A.M. to 7 P.M.
-Washtenaw Food Hub (Wed.) –6 P.M. to 8 P.M.
-Farm (Fri.)–2 P.M. to 7 P.M.
-Ann Arbor Farmers’ Market (Sat.) –7 A.M. to 12 P.M.
-Washtenaw Food Hub (Sat. )—9 A.M. to 12 P.M.
-Chelsea Farmers’ Market (Sat. )–8 A.M. to 12 P.M.
-NEW! Argus-Packard (Sat) (limited site)–10 A.M. To 12 P.M. INTRODUCING RICHARD, DEB, AND ARIANA…. 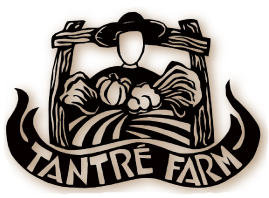 Some of our articles may feature some of the regular workers on Tantré Farm throughout the coming weeks. Here are the owners of the farm, Richard Andres & Deb Lentz, and their daughter, Ariana. Richard is working as a full-time farmer now, and continues using his carpentry skills through the many maintenance and building projects of the farm. Now Deb publishes the newsletter and coordinates the communication and bookkeeping of the CSA. She also continues to enjoy teaching to groups who come to the farm for field trips, as well as, in area schools through Farm-to-School programs. Ariana is starting her junior year in high school in a few months, working on the farm for the summer, and you may see her at the Chelsea Farmers Market on Saturday mornings. Both Richard and Deb enjoy the sense of community that running Tantré Farm creates for themselves and their daughter, as well as the many young interns/farmers who live and work on the farm, which provides the opportunity to serve the local community fresh, organic food. Bring broth to simmer in medium saucepan. Cover and keep warm. Heat oil in heavy large Dutch oven over medium heat. Add onion and saute until translucent, about 5 minutes. Add rice and chard and stir until chard begins to wilt, about 3 minutes. Add wine and simmer until absorbed, stirring occasionally, about 2 minutes. Add 4 1/2 cups hot broth. Simmer until rice is just tender and risotto is creamy, stirring frequently and adding remaining 1/2 cup broth by 1/4 cupfuls if mixture is dry, about 20 minutes. Mix in 1/2 cup Parmesan cheese; season to taste with salt and pepper. Transfer risotto to medium bowl. Serve, passing additional Parmesan separately. Place all ingredients in the blender or food processor, except the cheese, which is added after the first ingredients are pasty; and then blended again briefly. Serve this on hot pasta, boiled potatoes, green beans, sliced tomatoes, corn-on-the-cob, steak, fish, or mix with yogurt as a dipping sauce. Puree zucchini, cucumber, onion, vinegar, water, chile, 1 teaspoon salt and 1/2 teaspoon coriander in a blender until very smooth. Whisk remaining 1/8 teaspoon salt and 1/2 teaspoon coriander into creme fraiche or yogurt. Serve topped with dollops of creme fraiche or yogurt and basil or parsley. BREAD AND BUTTER PICKLES (from Mad Mares Cookbook) ••We have tons of cucumbers right now, so it may be time for pickles! !